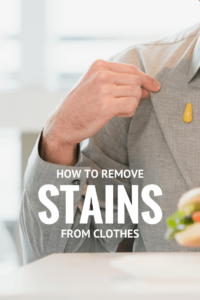 With all the cookouts, camping trips and other fun activities that make summer fun, you’re bound to find yourself wondering how to remove stains from clothing. Here’s how to treat some of the most common stains of the season so you can get out of the laundry room and back to having fun. Blood: Skinned knees and scratched hands are bound to happen. Try a simple cold water soak first; this is often enough to get fresh blood out of clothing. If the stain persists, make a paste out of salt and cold water, rub it in and then run water through the fabric. If all else fails, try soaking in hydrogen peroxide (spot test for colorfastness first). Once the stain is gone, wash in cold water. Berry juice: Soak in cold water 30 minutes and rinse. If stain persists, rub in liquid laundry detergent or make a paste out of the powdered stuff. Let sit 10 minutes then run more water through the fabric. Treat any remaining stains with a 3% hydrogen peroxide soak (spot test for colorfastness. Chocolate: Scrape away as much as possible, then rinse well with cold water. Dab on liquid laundry detergent and let sit 15 minutes before rinsing through the back of the fabric with cold water. If an oil stain remains, dab at it with a stain stick or some laundry ammonia. Launder as usual. Food coloring: See the directions here. Grass: Pretreat by rubbing in a liquid laundry or dish detergent then rinsing well. If the stain is still there, dab it with rubbing alcohol on a cotton ball. Add color-safe oxygenated bleach (like OxiClean) to the wash for final laundering. Ink: These steps work to get out both new and old ink stains. Ketchup, BBQ sauce: Scrape away as much of the spill as possible. Run water through the fabric to remove more of the stain. Then, make a paste of powdered laundry detergent or rub in liquid laundry detergent. Let sit 10 minutes and rinse well. If stain persists on cotton or wrinkle-resistant fabrics, soak it in white vinegar overnight then rinse in cold water. 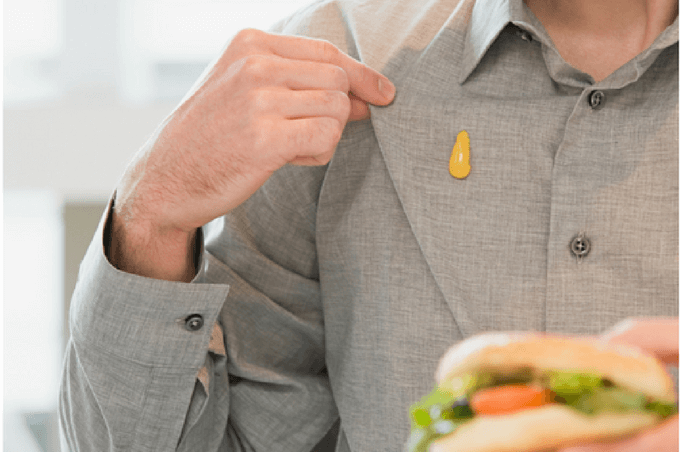 Mustard: Rinse in cold water, then rub in liquid laundry detergent. Let sit 30 minutes and rinse. If stain persists, soak the stain in 1 cup hot water and 2 tbsp. powdered laundry detergent overnight. Rinse, and add a color safe oxygenated bleach (like OxiClean) to the wash when you launder the item. Repeat process if stain is still there after washing. Sunscreen: Immediately dab away as much as possible, then pre-treat by spraying on a mix of 1/2 white vinegar and 1/2 water. It can, provided the material can handle it! Wouldn’t recommend it on silk, for instance. Love all your tips! Any thoughts on getting pen ink out of fabric? Or is that a lost cause? No, it’s not a lost cause at all! Try dabbing it with rubbing alcohol (or hairspray) and a clean white rag. Rotate your rag as the ink begins to lift away so you aren’t actually adding more of a stain. Good luck, and let me know how it turns out! Absolutely love your blog and your very useful tips! I ALWAYS struggle to get stains out of my washing so will definitely try your tips; thanks! Oh Raquel, I’m so flattered because I absolutely LOVE your blog, too! Seriously, the topics you deal with — and the graciousness of your spirit in dealing with them — have made my day so very many times. As for having a wonderful week… well, my husband was diagnosed with a brain tumor last Wednesday. It’s rough around here right now. But kindness like yours goes a long way to keeping me sane. Thank you. A remedy for colored stains, like red fruits, lipstick and pollen can be treated as follows: Rinse the stain with cold water and pat with a white cloth soaked in industrial alcohol to remove as much of the color as possible. Then rub the stain with dishwashing liquid and rinse in cold water before finally washing in the machine. Wishing you a happy summer with not too many red fruit spills! Thank you for sharing that! When I created this site, I was hoping it would become a repository for the knowledge we homemakers have learned through trial and error, as well as the hand-me-down knowledge that young women used to acquire from their mothers. It makes me VERY happy that you’re generous enough to share your tips with HWHT readers. Thank you!